The two-day FOMC meeting concluded at 2 p.m. today (Wednesday, June 15) with its latest policy statement and economic projections. As widely expected, the U.S. Federal Reserve did not raise interest rates. Despite no interest rate action, Janet Yellen and her team of Fed officials gave important economic and rate hike projections for the rest of 2016. 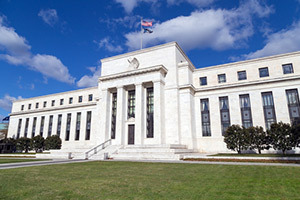 The Federal Reserve will maintain an accommodative approach to monetary policy. The committee cited goals of supporting improvement in the labor market and returning to 2% inflation as reasons for the stance. The interest rate path will depend on the economic outlook as informed by the most recent economic data. The Fed now projects one rate hike in 2016 and three or four hikes in 2017. Although economic activity appears to be growing, improvement in the labor market has slowed. Despite the falling unemployment rate, job gains have diminished. Growth in household spending has strengthened. Since the beginning of the year, the housing market has continued to improve. Due to falling energy and import prices, inflation remains below the Fed's 2% target. Although the inflation rate is expected to remain low in the near term, officials expect an increase to 2% over the medium term. This will occur as the effects of past declines in energy and import prices disintegrate and the labor market strengthens. Just two weeks ago, the Federal Reserve was poised to hike interest rates at either the June or July FOMC meeting. But the miserable May jobs report showed the worst job market performance since 2010, all but taking a June rate hike off the table. It also made a July rate hike much less likely. Even if rates are raised at the July Fed meeting, Money Morning Global Credit Strategist Michael E. Lewitt said it doesn't matter what the Fed does. He believes Yellen and her board of officials waited too long to hike rates. Lewitt said the Fed should have started seriously talking about and lifting rates two years ago. And he's quick to add that they shouldn't do it now. Moving on rates earlier would have enabled the Fed to keep the United States off the negative interest rate path. Negative interest rates are now being used by a spate of other nations. According to Lewitt, policymakers have now lost the opportunity to raise rates. In fact, the U.S. central bank committee has discussed using negative rates, which sounded alarms. You see, the U.S. economy is still recovering from the 2008 financial crisis and talks have surfaced about a new recession. That's because the U.S. economy barely budged in Q1 2016, expanding at just 0.5%. That was the slowest GDP rate in two years. The second GDP read pegged Q1 2016 growth at 0.8%. And corporate profits continue to fall. The estimated earnings decline for the S&P 500 Index in Q2 2016 is 4.8%, according to FactSet. If the broad-based index reports an earnings decline in the second quarter, it will mark the first time the index has recorded five straight quarters of year-over-year (YOY) declines in earnings since Q3 2008 through Q3 2009. Trade and demand in the United States are also weak. Manufacturing is hovering just above recession levels. And the situation globally is even worse. Trade is crumpling, manufacturing is in recession, and demand for goods and services is dwindling. "Global trade is at its second-lowest level since 1958, and is falling in both dollar and local currency terms," Lewitt explained. Additionally, delinquency rates on auto and student loans are rising. Low commodity prices, meanwhile, are causing rising delinquency rates on agricultural loans. Over 70 oil and gas companies have already filed for bankruptcy and more are expected. Delinquencies on business loans are also accelerating. And the default rate in the high-yield bond market is spiking. And don't let the current 4.7% unemployment rate fool you. The employment-to-population ratio sits at a glum 77.7% for those 2 to 54 years old. That compares to 80% in early 2008, and 78.8% in September 2008 at the time Lehman Brothers collapsed. "That's significant," Lewitt adds. "This means the Fed may be about to embark on a tightening cycle with the employment-to-population ratio at its lowest level in decades. It has never made such a move before with this ratio below 80%." While the Fed appears more dovish, raising rates is still the plan. Stay tuned to Money Morning for continued coverage of the FOMC meetings in 2016.